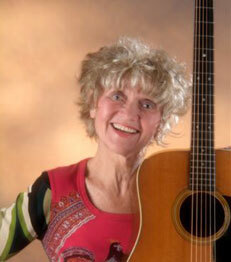 Carol Johnson has been an active performer most of her life, playing guitar and singing since childhood with four sisters throughout her native Wisconsin, and earning degree in music from the University of Wisconsin at Eau Claire. She participated in the college scene coffee house and hootenanny days, and was a peace troubadour in the 60s in New York City. She then began a career of solo club work in Nashville, Tennessee, where she moved primarily as a songwriter. Her current passion and focus on uplifting childrens and family music began and blossomed as she raised her own two children. In addition to nationwide appearances at thousands of schools, libraries, festivals, camps, churches and conferences, she has sung at the Grand Ole Opry, at Wolf Trap International Childrens Festivals, has been featured with the Grand Rapids Symphony, the Meijer Gardens Summer Family Series, and with the St. Cecelia Music Society Youth Choirs. Shortly after the Berlin Wall fell, she was privileged to take her songs and song-leading talents to Russia; more recently she led songs of peace at Corrymeela, a center for peace and reconciliation in Northern Ireland. Through a series of songwriting sessions with children in high risk neighborhoods in her hometown, she and the children created songs of peace, which became her latest CD, Circle of Peace. Hundreds of thousands of children have enjoyed her popular Music With A Message assembly programs in elementary schools; she is a frequent soloist at Unity and other churches, on occasion leading the entire service. She has produced seven recordings (four especially for kids) and three songbooks of original works. One of her childrens recordings received a Parents Choice Award. Other artists, as well as publishers of songbooks, textbooks and curriculums, seek to include her material. One of her best known songs Love Grows One By One has been recorded by at least a dozen other performers. And she is well represented in the popular folk songs collection Rise Up Singing. Two grown children and their spouses, a granddaughter, a life partner, and two cats fill her life, along with other loves, such as biking, painting, walking dunes and beaches, and hiking. Her greatest passion remains that of using her musical talent to bring joy and healing to the planet. Concerts and song leading have taken her as far as Russia, and most recently to Northern Ireland. She has seven recordings and three songbooks of original music, and she thanks you for visiting her Web site! Web design by Nivar, Inc.
, Carol Johnson Music. All rights reserved.